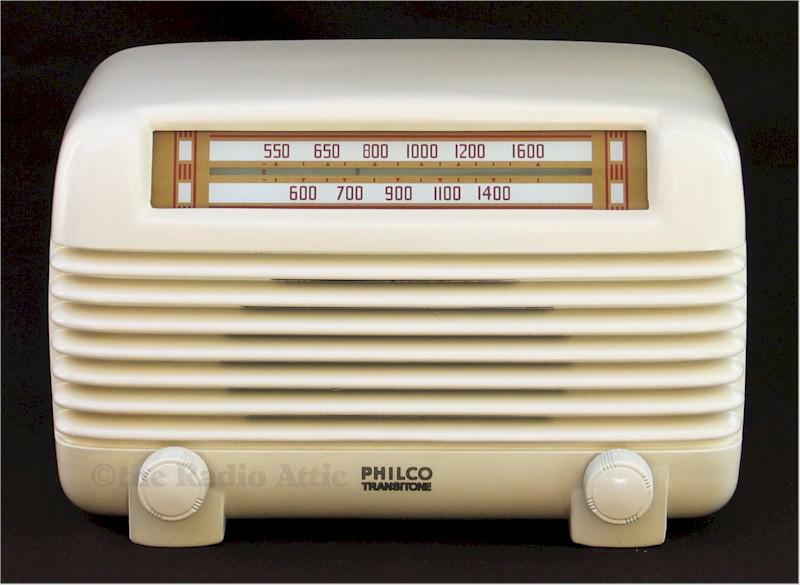 The ivory version of this fairly common Bakelite Philco table radio is better-looking and harder-to-find than its plain Bakelite sibling. This one has a nice new reproduction glass dial and a new reproduction back, and has been repainted in its original ivory color. The chassis is Philco's take on the "All American Five" circuit, using Philco's "Loktal" tubes. This radio has had a full electrical restoration, with all electrolytic and paper capacitors replaced, new resistors where needed, a full RF/IF alignment, and a modern polarized power cord with circuit modifications for improved safety. The 4 x 6 inch speaker puts out good sound, and you will be surprised at how good the sensitivity of a well-aligned five-tube radio can be. Lighted dial. 11-1/2"W x 7-1/4"H x 6-1/2"D.
You are visitor number 569 to this page.